Eschew Sunday lunch and instead dive into the inner workings of Roadburn 2019. 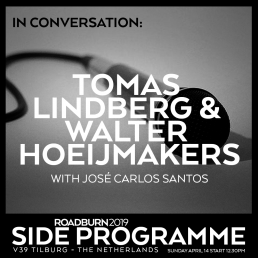 Roadburn’s artistic director, Walter Hoeijmakers will be joined by this year’s curator, Tomas Lindberg – to talk about how they worked together to bring us the incredible line up that stretches before us (and that by the time this happens, we’ll be three quarters of the way through devouring!). How much of the line up is dictated by their personal preferences, and how much is about giving the audience what they want to see? What records kept them going during long nights slaving over timetables and invitation emails? Journalist José Carlos Santos will be putting these questions and more to the pair, before turning over the microphone to the audience for further questions.